Chicago Tribune beer writer Josh Noel penned the term “pastry stout” in his recap of the 2018 the Festival of Wood and Barrel-Aged Beer, or FOBAB, after finding a surprising number of cake and cookie-inspired beers — gingerbread, German chocolate cake, milkshakes, etc.— at the annual Chicago beer festival. What is a pastry stout? 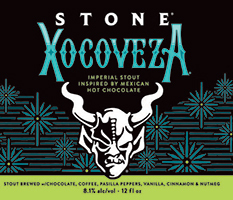 Stouts made with any number of baking ingredients, such as cinnamon, coconut, chiles, cacao nibs, (Noel also includes coffee in this mix, but Peaks and Pints thinks that’s crazy talk). Critics believe some of these beers have taken flavor additives too far and obscured the soul of good beer, but there are some delicious examples to seek out, such as the five pastry stout in our flight today, Craft Beer Crosscut 1.15.19: A Flight of Pastry Stouts. No judgment. Kick your peanut butter fix up a notch with Belching Beaver Brewery’s Mexican Chocolate Peanut Butter Stout. Formally named Viva La Beaver, and prior, Living La Beaver Loca, Belching Beaver changed the name to highlight the key flavors of this award-winning beer: creamy peanut butter, cinnamon and cocoa nibs. Peaks and Pints also picks up notes of roasted coffee, cookie dough, fudge, brownie batter, cappuccino, toffee and dark roasted malts upfront, as well as a little vanilla on the mid-palate. This decadent milk stout is the definition of pastry stout. Jeppe Jarnit-Bjergsø contract brewed at Westbrook Brewing in South Carolina before moving his Evil Twin Brewing to New York City. As he brewed his Biscotti Break imperial stout with vanilla, almond and coffee he drank Westbrook’s Mexican Cake imperial stout with cocoa nibs, vanilla beans, cinnamon sticks, and fresh habanero peppers. Then one day Biscotti Break met Mexican Cake and they knew it was much more than a hunch. Soon they became the Imperial Mexican Biscotti Cake Break, an imperial stout brewed with coffee, cinnamon, almonds, cocoa nibs, vanilla and habanero peppers. People freaked out. 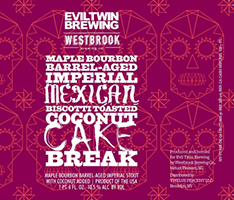 The two brewery’s kept the drive alive, brewing variants of the Imperial Mexican Biscotti Cake Break, including Maple Bourbon Barrel-Aged Imperial Mexican Biscotti Toasted Coconut Cake Break — a 10.5 percent ABV imperial stout brewed with almonds, cocoa nibs, coffee, cinnamon, habanero peppers, toasted coconut and vanilla beans before being aged in maple bourbon barrels. As a child Omnipollo’s head brewer wanted to be a pastry chef. He found his inspiration for Noa Pecan Mud Cake in the celebrated American dessert. Thick, rich and excessively decadent, this imperial aims to bring back childhood memories. Noa Pecan Mud Cake pours a dark, velvety black with a creamy mahogany-colored head. The bouquet gives an immediate hit of caramelized pecan followed by chocolate and toasted marshmallow scents. This luxurious beer is the amalgamation of a rich, fudgy brownie, toasted pecans and s’mores. Thick and chewy in texture, a massive chocolate overtone is enhanced by underlying notes of graham cracker, lightly toasted marshmallow and nuts.